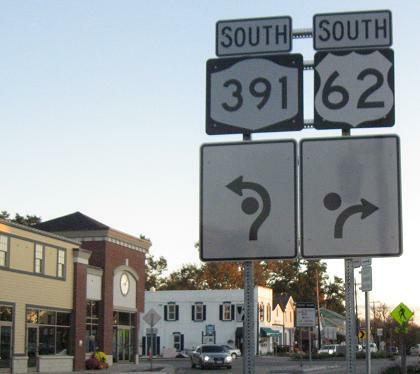 What route are we on, anyway? It's frustrating to see the correct shields already posted and the wrong ones go up even right next to them. 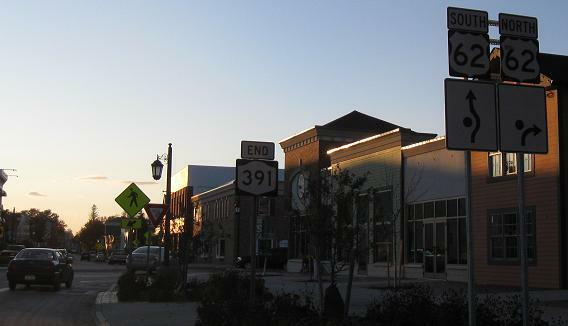 The contractor may say, "I'll be damned if I'm going to redo all these signs," but it's up to the DOT to monitor the work and get them replaced. There's no reason not to - contractor error is contractor responsibility. Or is it the DOT's fault? The humped 62 shields look no better than the rounded 39 shields. 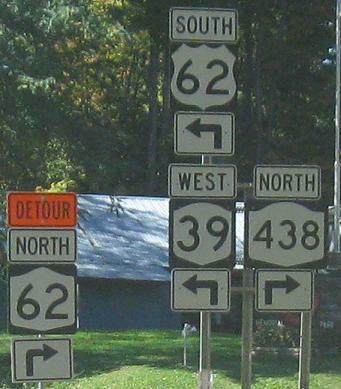 The three legs of the new Hamburg roundabout. The MUTCD allows standard left/through/right arrows to be used instead of these overwrought roundabout arrows, and that would have been a good call. 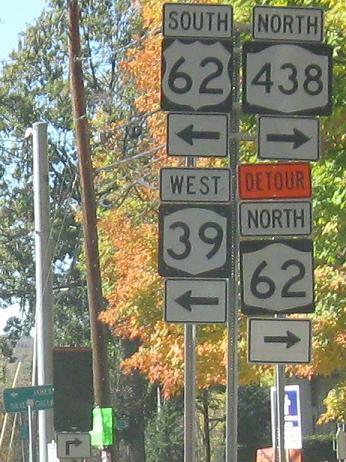 Actually, all of NY 391 is former US 219, which ended right here until the freeway north of Springville was constructed. 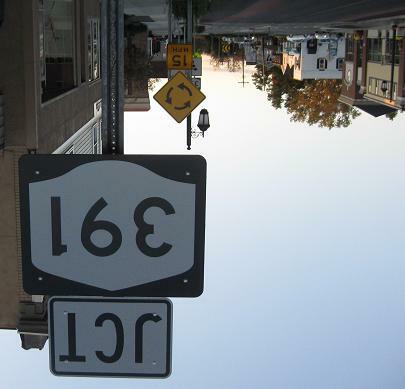 Adjust your eyes, but no, this photo isn't upside-down. See the hump on top of the shield and the point on the bottom? Clearly not upside-down. And now your eyes can go crazy as I spin opposite the direction of traffic from the very middle of the roundabout. 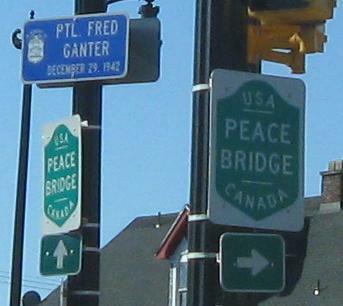 SB through Buffalo to Genesee St. and newer non-cutout bridge shields. 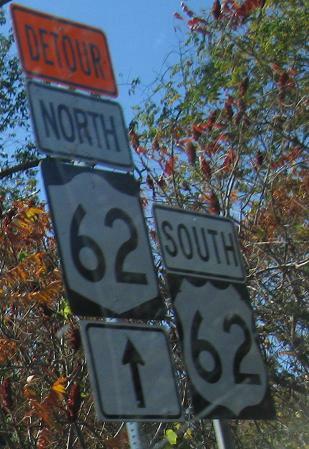 Click on the much older US 62 shield, one step removed from having "US" inside, for a closeup. NB on the other side of a soap box derby that was using the humped railroad overpass south of Walden Ave.
One more shield with the old font, at Bogardus St. just south of the last few photos. 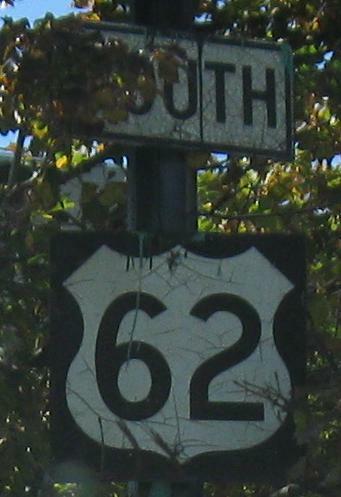 Eastbound on US 62 SB. 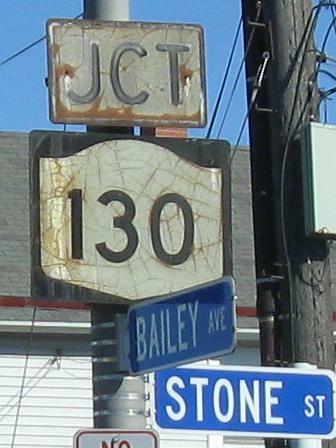 That's as confusing as blued-out I-190 shields and the wrong kind of shield. 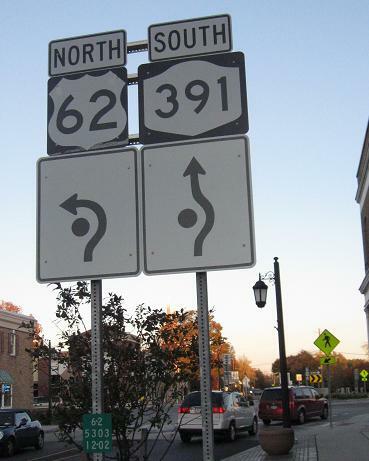 Two NB shield errors courtesy Doug Kerr somewhere from Buffalo "north" to Niagara Falls. 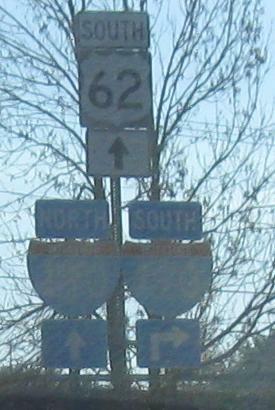 The end of US 62, presented courtesy Doug Kerr, faces due westward, which is odd because most of the route is running northeasterly. 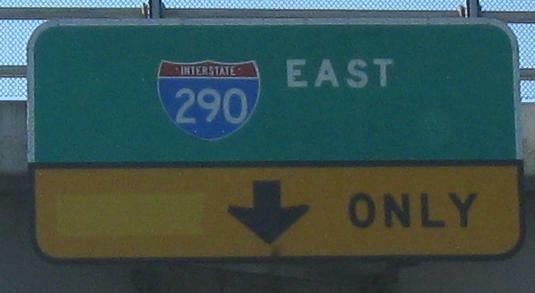 For an even number, it does a lot more north than east, coming out of El Paso, TX. 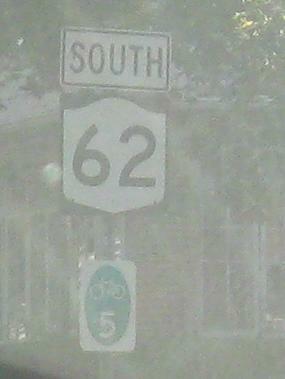 The problem here is that NY 62A was less distinguished than its US parent, and signage should reflect that. 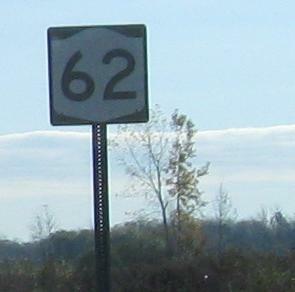 This is not only an error, but is now a historical photo as well, because NY 62A was renamed Business US 62 for no good reason. 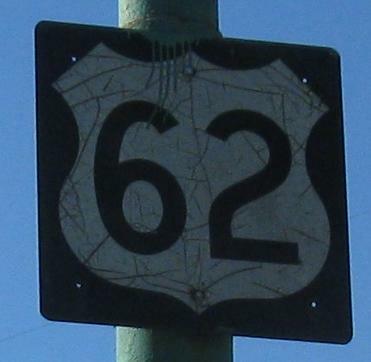 At least it's a US Highway now, like it was back when it was actually US 62. 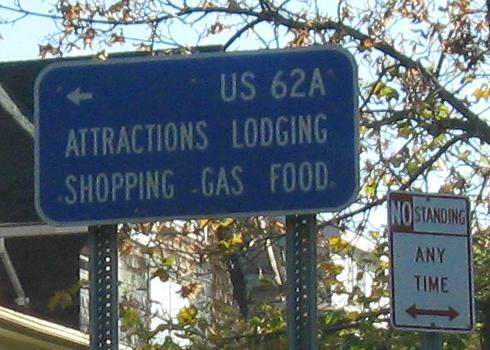 Both problems combine SB in Niagara Falls. 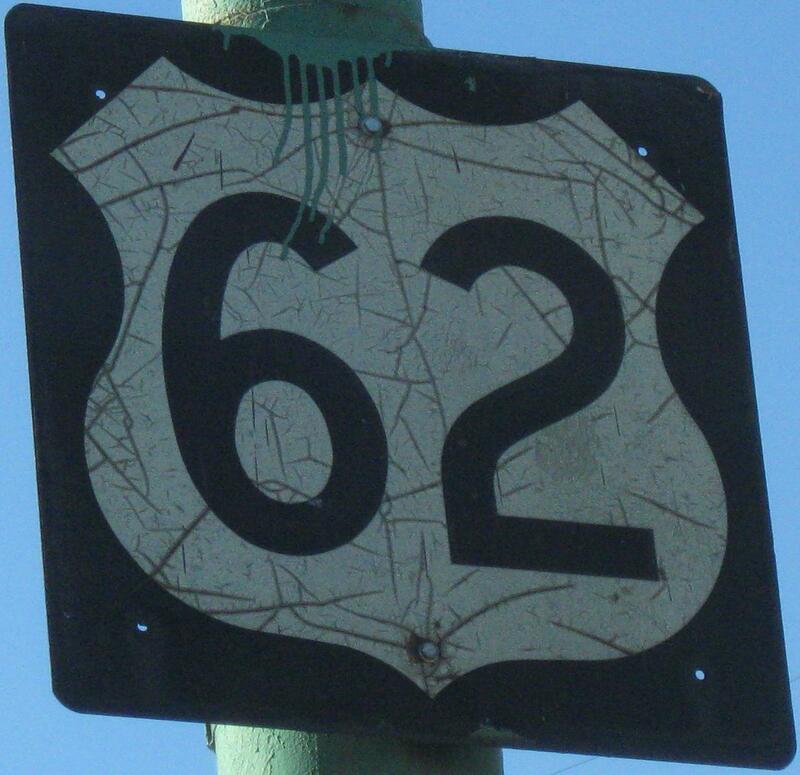 Clearly it wasn't an issue of choosing the wrong shield blank - the city was convinced 62A was a US route. I took these photos after the changeover to Business 62, even. 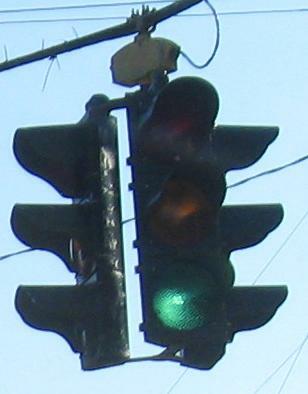 The old signal is above 19th St.